It does it all! We are sure that it will be the newest staple in your wardrobe! With the Oslo style in particular, you'll be making fashion waves along the shore. Pair this trendy striped top with sandals and a floppy beach hat. We couldn't create a premium breastfeeding cover without the best fabric around. All of our nursing tops are made from one of the softest, lightest, and most comfortable fabrics, Modal®. It only takes one touch to know that this is not run of the mill cotton. Modal® fabric is crafted from the pulp and fiber of the Beechwood tree, which comes only from forests that are managed in a sustainable way. All Covers are hand cut and sewn locally in San Diego, California to ensure the highest measure of manufacturing quality. Our maternity covers fit a broad spectrum of body types. 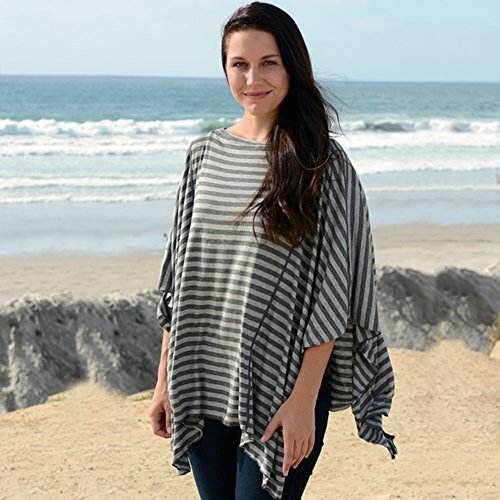 The nursing tops fit comfortably as a poncho without looking like any ordinary type of maternity item, and the DRIA cover has plenty of space for your baby to discreetly and peacefully breastfeed without the obvious appearance of many other nursing covers. The neckline is flexible enough to be easily pulled aside in order to check on your baby while feeding. If you have any questions about this product by DRIA Cover, contact us by completing and submitting the form below. If you are looking for a specif part number, please include it with your message.